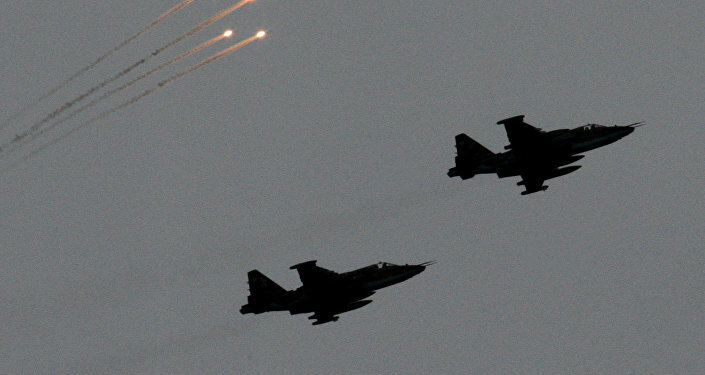 The advanced aircraft are delivering airstrikes against the terrorists' positions in Syria. MOSCOW (Sputnik) — Russian Su-34 Fullback advanced attack planes are taking part in airstrikes against Islamic State militants in Syria, the Russian Defense Ministry said Thursday. "Russian Su-34 multipurpose attack planes have just returned to the Khmeimi air base [near Lattakia] after carrying out a combat mission," spokesman Maj. Gen. Igor Konashenkov said. Konashenkov added that Russian Su-24M and Su-25 jets carried out on Thursday a total of eight airstrikes on five ISIL targets in Syria. According to Konashenkov, the airstrikes destroyed an ISIL command post in the Idlib province. Try the Crushing Power of Russian Su-30SM’s Gun!